- He has lost approximately 45 pounds. - The upper blood pressure remains stable in the "healthy" range. - The lower blood pressure also moves in the "healthy" range. - The pulse rate has leveled in an optimal range. - His general health condition has improved significantly. - His physical condition is much better than before. The key to success was an increased, but still reasonable, physical exercise combined with a healthy died. After eight years the health of the author improved significantly — without any additional medication. 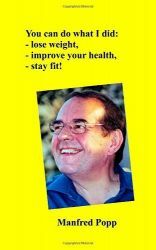 In sum the author is convinced that his program also works for other "best agers" as well as for younger peoples. to lose weight, to realize fitness and to get a good health!